"Youth Civic Engagement in Hong Kong: A Glimpse into Two Systems Under One China"
Introduction: This chapter examines youth perceptions regarding civic engagement during a tumultuous time in Hong Kong. We begin by examining the historical context of Hong Kong, tracing changes in its political status and educational system in relation to civil attitudes and behaviors of its population over time, particularly as Hong Kong shifted from a colony of the British Empire to a Special Administrative Region (SAR) of the People's Republic of China towards the end of the twentieth century. 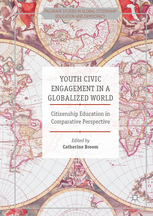 Next, the chapter discusses the findings of a study of Hong Kong youth perceptions of civic engagement, comparing the views of youth with two distinct prior experiences of civic education: university students in Hong Kong who were previously educated in Hong Kong or Mainland China. The study reveals significant differences between these groups, with important implications for reforming civic education in Hong Kong.